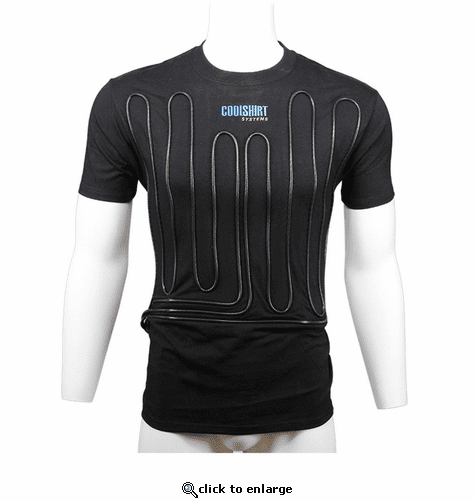 Cool Shirt Cool Water shirts are designed to help you maintain a safe core body temperature whilst in hot environments. These unique garments feature built-in, non-kink tubing throughout to supply consistent, continual cooling to the wearer's torso. Connect them to any of the Cool Shirt delivery systems to have cold water pumped around the shirt drawing off the heat and cooling you down. Cool Shirt Cool Water shirts help to reduce dehydration and prevent heat stress. Wearers can expect increased productivity and reaction time, with reduced errors! Designed to be used with Cool Shirt Cooling Systems, these shirts are a smart investment for your health, safety, and comfort! This Cool Shirt is made of cotton. This Cool Shirt features a Right exit to connect to a cooling unit. PLEASE NOTE: ALL COOLSHIRT ITEMS ARE PURCHASED SEPARATELY. MAKE SURE TO ORDER ALL NESSESSARY PARTS FOR THE SYSTEM TO WORK PROPERLY. Cool Shirt Systems and hoses sold separately.